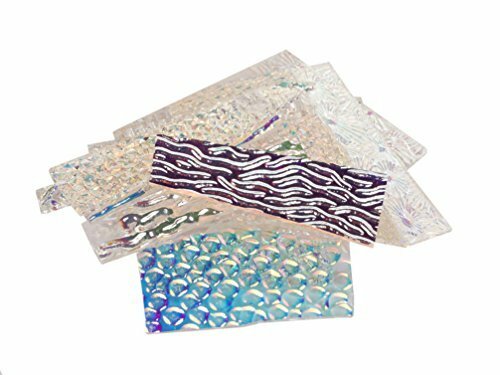 Scrap Pack includes 1/4lb of textured dichroic glass in assorted colors, shapes, sizes and textures. 90 COE. Create with 8 new Wissmach textures on clear glass coated with Austin Thin Flims DichroicMagic®. Photo is one example. Assortments will vary. SCRAP PACK - 1/4 lb. 90 COE. WISSMACH TEXTURED - Presented on clear dichroic glass. VARIED ASSORTMENT - All pieces differ in shape, size, and color. 8 NEW TEXTURES - Perfect for exploring the shimmering look of dichroic glass. If you have any questions about this product by DichroMagic Dichroic, contact us by completing and submitting the form below. If you are looking for a specif part number, please include it with your message.